OTE Group is the largest telecommunications provider in the Greek market, and, together with its subsidiaries, forms one of the leading telecom groups in South-Eastern Europe. Aimed at continuously optimising customer experience, OTE Group proceeded with establishing COSMOTE as the unified brand for all Group products in fixed-line and mobile telephony as well as internet services and pay TV. OTE Group offers the full range of telecommunications services: From fixed-line and mobile telephony, broadband services, to pay television and ICT solutions. In addition to its core telecommunications activities, the Group in Greece is also involved in maritime communications, real-estate and professional training. COSMOTE customers require appropriate terminal equipment (routers, mobile phones, etc.) for their telecom services. With a view to expand the lifetime and overall utilization of the equipment provided to customers but also to ensure the proper end-of-life management of terminal equipment, contracts for fixed telephony, internet and TV include lease terms for the equipment provided (assuming that the customer chooses to secure the necessary equipment from COSMOTE). This provision is made at no cost to the customer under the obligation that when the contract ends the equipment is returned to COSMOTE and GERMANOS shops. Returned equipment undergoes detailed control checks, is repaired if necessary and put back in the market fully operational. Discarded equipment is forwarded for recycling through the authorized entities COSMOTE cooperates with. Reduce the cost to the customer of high quality services. Expand the lifetime of the necessary terminal equipment and as a result the value of the resources embedded. Reducing resources consumption and waste generated. Fewer quantities of new equipment procured, less electronic waste, and less transport pollution. During 2016, 85,969 pieces of equipment were checked and 67,790 pieces of them were refurbished and put back in the market. In the years 2013-2016, around 80,000 pieces have been recycled. Recycling of discarded equipment is ensured since the customers are obliged to return the equipment to our shops when the contract ends. Assure the public of full functionality of used equipment. Encourage suppliers to provide products with expanded lifetime and higher repairability and possible upgrading capability. A transformation of business structures and a restructuring to business processes is needed. 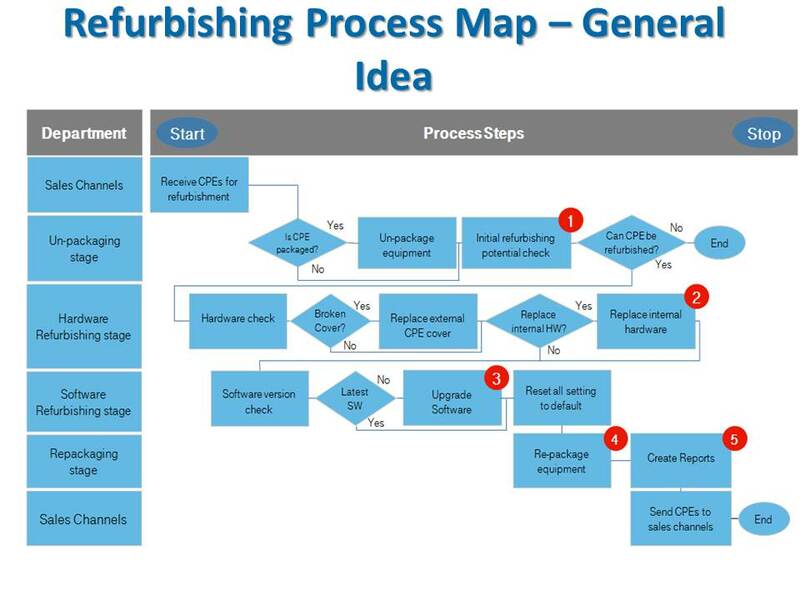 Low consideration in promoting refurbished equipment in retail networks and clients.